When he arrived in America from his native Persia, the only word of English that Sir Ali knew was “jazz.” He was familiar with Charles Mingus and Max Roach, but also Frank Zappa, The Kinks, and Samuel Beckett, whose plays he used to direct in Tehran. While studying art in Oklahoma and Chicago, he added “Sir,” the most common Western title, to his given name, Ali, the most common Eastern name, to create his professional pseudonym. When he goes to England, though, people get upset. He came to Paris seven years ago and ended up staying. Though he was born under the sign of the lion 33 years ago, Sir Ali chose to ride into 1986 with an elephant. 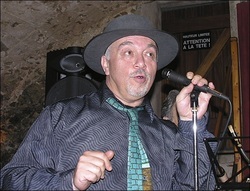 Long-time disc jockey for Radio Nova, jazz and world music specialist at Actuel magazine, performance artist, theater trickster, and musician, Sir Ali was asked at the beginning of the year to animate the pre-disco hours at the fashionable Les Bains nightclub on Monday and Tuesday evenings. And so from ten to one, he organized and promoted listening music at his “club within a club,” L’Eléphant Blanc. From the outset, his program offered a variety of music styles, alternating jazz with chamber music and even comic vocal routines. Ramuntcho Matta brought both a quartet and a modified band to the club. One constant in both groups was Guillermo Fellove, the endlessly inventive Cuban trumpeter. Ramuntcho’s music is a rich yet spare fabric of Latin, new wave, and jazz strains stitched together by his own guitar work. Among the crooners who performed at L’Eléphant Blanc were the Melody Four with Lol Coxhill, Tony Coe, and Steve Beresford. Trombonist Mike Zwerin’s soft trio, Zip, also appeared with Paul Breslin on guitar and the splendid Marten Ingle on bass and most vocals. They played jazz and pop standards and originals with a light twist. A variety of bands were on the winter program, but Sir Ali’s latest passion, his own exciting ten-piece band, Sir Ali’s Girls, developed an ongoing workshop at the club. The two horn players, the rhythm section, and the three women singers come from Europe, the Caribbean, and Africa. Sir Ali himself does some arranging, chooses most of the eclectic repertoire, adds touches on tenor sax, and in his gravel-voiced growl sort of sings. This group gradually gathered steam, and in early June, they gave a breakout performance at the New Morning. Besides featuring his own group, Sir Ali occasionally hosted various singers and musicians he has worked with, or would like to work with. He either gave them their own nights at the Eléphant Blanc or built bands around them. For example, after several evenings with the Japanese tenor sax powerhouse Shimizu Yasuaki, the club offered nights with each of the two vocalists from the workshop band: Guyanese Véronique Koné and Austrian-Israeli Timna Breuer. Later on, his program featured the seductive and sparkling French redhead, Sèverine Angèle, a singer who is still with the band. Other nights included comedian Farid Chopel’s impressions of singers, gypsy violinist-guitarist Claude Alvarez’s band, and sax veteran Barney Wilen’s quartet. Sir Ali also assembled a chamber orchestra for the club, which sometimes provided background for the singers and other times performed alone. The house band itself usually consisted of Marten Ingle on bass and vocals, Bruce Grant on reeds and woodwinds, Raphael Sanchez on keyboards, and Negrito Trasante on percussion. Occasional appearances were also made by Zwerin, Fellove, and Sir Ali himself doing his own inimitable vocals. His primary focus, however, has been the band, whose sound he has been blending, mixing, and experimenting with all year long. Recently he found two new singers: Natasha Cashman is Irish, and Murel Mondon is mostly Martiniquaise. Italian keyboard player Claude Arini, who has worked with Johnny Hallyday, also joined the formation, along with French drummer Christophe Gaillot, Puerto Rican conga player Daniel Maldonado, and Zairois bassist Moïse Mupech. Veterans who have remained include Sèverine Angèle, Fellove, and Denis Barbier, the fluid and very fine player of flute, alto sax, and cello. What the Persian Sir Ali has created in this group is a solution to the Tower of Babel. The answer lay in music all along. The singers communicate on many lines, while drawing on quite different cultures, background, and voices. They are all equally skilled at singing lead, chorus, or taking instrumental lines—Sèverine’s voice follows the trumpet, and Muriel’s the sax; Natasha will soon tag the trombone of Mark Sims, whom Sir Ali wants to add to the band. In their most recent concerts at La Chapelle des Lombards, the dancehouse near the Bastille, Sir Ali’s Girls performed 19 types of music (soul, beguine, salsa, ‘60s pop, samba, calypso, rap, swing, bossa, and more). The group plays three different repertoires: besides dance music, they do jazz (their mambo version of “Blue Monk” with lyrics, and “Sophisticated Ladies”) and cabaret (Chevalier and Josephine Baker tunes). Their list of local hits illustrates the group’s range. There are three versions of “Just a Gigolo”—tango, swing, and hard rap. From Eartha Kitt, there is “Mambo de Paree,” an old Parisian postcard sung in Franglais, which complements their moden postcard of the city, “Bossa Parissa.” And from Miriam Makeba comes the calypso “Naughty Little Flea.” The band also performs the leader’s arrangement of “Sixteen Tons,” the traditional work song from the American South, and his version of Henry Mancini’s “Baby Elephant Walk,” with new lyrics and music added.